Q: Where should the movement joints be placed? A: The tile industry recommends allowing for expansion and contraction in every tile installation. In small rooms, a gap at the perimeter of the room (sometimes hidden by baseboards) is sufficient. In larger areas, the movement joints will be visible. Exact location and frequency of movement joints are site relate. TCNA offers guidelines in Detail EJ171 of their handbook. It is important to note that interior movement joints are placed more frequently if they will be exposed to moisture or direct sunlight. Exterior applications will also need special consideration because of the range of temperature from summer to winter. Q: What is the best subfloor application for tile? Q: Are there any surfaces that tile should not be directly bonded? Q: What is the best way to install tile? A: Like movement joints, the installation used depends on the type of tile, site conditions and substrates. The American National Standard Specifications for the Installation of Ceramic Tile (ANSI), A108 and A118, plus the Tile Council of North America (TCNA),Hand book for Ceramic , Glass and Stone Tile Installation are the industry standard. The TCNA handbook has easy to interpret charts for different applications and general information. One thing that should be abided by is if the product manufactures have installation recommendations for their specific products. You can also contact trade associations like us, for help with technical advice for your specific project. Q: Why do my field mortar samples have low breaks? A: A field mortar sample compressive test is not required. ASTM C 1586 discusses this in detail, 4.3.2 states “Do not use the Specification ASTM C 270 Property Specifications requirements, (psi 1800 type S), to evaluate construction site-produced mortars. 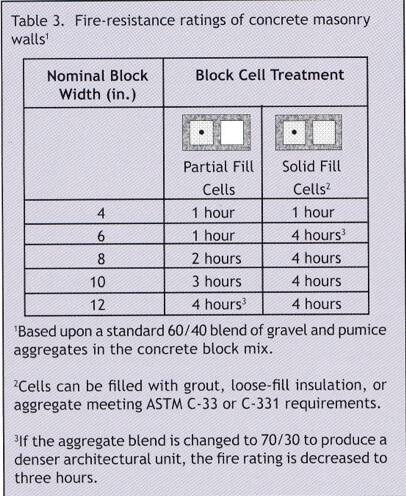 Due to the higher amount of water necessary for actual masonry construction, mortar produced and sampled in the field will typically have lower compressive strength than that produced in the laboratory per Specification C 270.” ASTM C 780 is used to test field mixed mortar and is used to determine product consistency, not compressive strength. These references indicate that for various reasons field mortar compressive tests do not reflect the actual performance of the mortar in the finished assembly. Quality control for mortar compressive strength is determined by laboratory testing. The manufactures should have test results and letters to certify this. Q: If brick veneer has a flashing system, does it need water repellent on the exterior surface? A: In very wet areas of the country, like that Pacific Northwest, surface applied moisture repellents have a twofold purpose. Number one is to act as a first line of defense against water penetration into the building and taking some of the strain off the cavity drainage system. Second is less water penetrating the surface of the masonry means less catalyst for the movement of water-soluble salts (efflorescence) to be deposited on the surface. Q: Do you need Base Flashing on Single Wythe masonry walls? A: The base flashing detail for a single Wythe masonry wall is mostly used in other parts of the country. It is not used in the northwest because we are in seismic zone D which requires the use of horizontal steel reinforcement, placed in grouted bond beam blocks no less than 48” on center. Base flashing details are used in other parts of the country because without grouted bond beams you have tall unrestricted vertical cells that could accumulate water, through moisture penetration or condensation that would puddle at the bottom of the wall and have any way out. The main drawback to this was that it created a bond break between the masonry wall and the foundation creating a weak point in the wall. The product Blok Flash eased the concerns about the bond break by leaving more surface area for the mortar to bond to the face shell of the CMU. Q: What are the best weather joints for the Northwest? A: Because moisture penetration is such a concern in the northwest, you will want a mortar joint that is compressed, which helps the mortar to bond to the adjacent units and does not leave a place for moisture to accumulate. For these reasons, a concave or v joint is the best selection. Q: How do you determine the fire rating of a CMU wall? A: Fire ratings are based off Equivalent thickness values for CMU and the material composition. 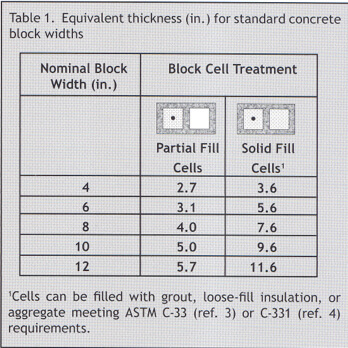 Equivalent thickness values for standard concrete block are shown in Table 1 from NWCMA Tek Note Concrete Masonry fire Resistance. Individual block manufacturer may have higher values based on a greater percentage of solids. Standard Bock manufactured in the Northwest are approximately a 60/40 percentage blend of gravel and pumice aggregates. The required equivalent thickness values at achieved various fire rating are shown in Table 2. Application of the information in Tables 1 and 2 results in the listing of concreter masonry wall fire ratings in Table 3.